There wasn't any real danger of the Indian Grand Prix being cancelled, was there? Well, we certainly didn't think so. Given that the Formula 1 circus had descended into India and that the Buddh International Circuit was abuzz with activity, it seemed really unlikely that the race would suddenly be packed up. 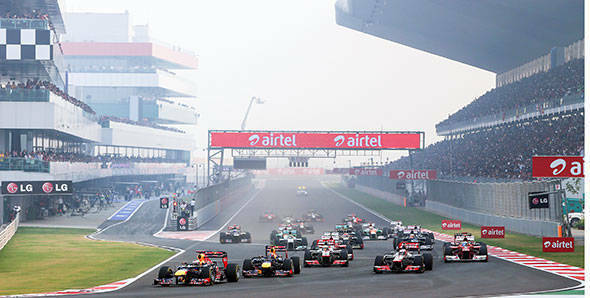 However, there was no denying that a protest had been filed for the Indian GP to be cancelled by one Amit Kumar. The grouse that the petition stated was that the JPSI hadn't paid entertainment tax levied on the event the previous year. And with the hearing scheduled to take place on Friday, there was some amount of concern that the Grand Prix could yet be cancelled. Now, though, the Supreme Court has postponed the hearing to have the race cancelled. At a date after which the race has already taken place, the hearing will occur. But, ahem, given that the race will already have happened, it's all moot really. So, by the time the petition is finally heard in the Supreme Court, Sebastian Vettel will likely have finished sipping the champagne on the top step of the podium and also have finished celebrating his fourth world championship win.